Unified Communications solutions continue to quickly evolve as more businesses realize the benefits of integrating and streamlining their communication tools. 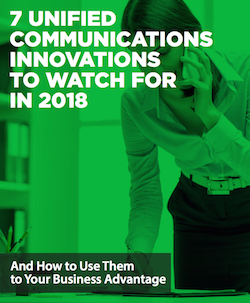 2018 will likely be a big year for Unified Communications, as there are several big innovations on the horizon. If you currently utilize UC or are planning on investing in UC tools, it will be worth your while to pay attention to these developments.